Kenny's Tile is your home remodeling, flooring and home decorating solution in Lee's Summit. Home decorating starts with choosing the background elements for your home such as the flooring, wall coverings, countertops, and ceiling. Changing just one of these can instantly transform the look of your home. At Kenny's Tile, serving the Lee's Summit area, we have all of these available at prices that are lower than the competition. Come to our showroom to see what a new floor covering or counter can do for your home's appearance and value for your Lee's Summit home remodeling project. Countertops are a staple in the kitchen and bathroom. In these locations, the counters occupy a large amount of the visible space in the room and must be aesthetically pleasing. The wet atmosphere of bathrooms and kitchens requires the counters to be equally durable and water-resistant. At Kenny's Tile, we have our own separate division dedicated to counters called Graniteworks. Graniteworks has over 60 countertop options in granite, travertine, and marble. Our Graniteworks products are available along with our other offerings at our showroom, just a short trip from Lee's Summit. At the showroom, you can get everything you need to change the look of your kitchen or bathroom, including the sink. 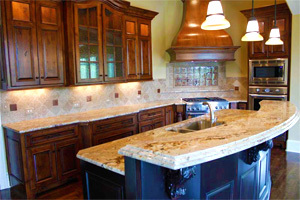 Our Graniteworks division also creates the unique granite countertop your home needs. We have a wide selection of granite countertops, tile, hardwood flooring, and stone in our showroom. Come visit us today, and we'll be able to design and install the project of your dreams. Our name is Kenny's Tile, and therein lies our specialty. Whether your Lee’s Summit home needs tile installed or repaired, we have the products and services you need. Just a few of our tile products are: slate, stone, travertine, ceramic, and porcelain tiles. Come to our showroom to take a look at these and many more options for your home's floor or wall coverings in tile. We offer the best in-stock selection of tile in the area. In addition, we have a designer on staff every day who can help you with your project from start to finish. Whether you are handling the project yourself or we provide the tile installation for you, we are happy to help choose the right tile, color, and design for your kitchen or bathroom Lee's Summit home remodeling project. If you want something softer underfoot than stone tile, we have other options. Hardwood floors have a rich look that can easily be changed with the addition of a throw rug. Carpeting is a popular option in many homes with children because it provides a softer place for the younger set to play on the floor. We have the carpeting and hardwood flooring products you are looking for, and our trained staff will professionally install the flooring of your choice, too, without outside contractors. We can even install hardwood staircases. Remodeling your Lee’s Summit home may require services beyond just new floors, counters, or walls. We provide construction and installation for bathroom remodeling like sinks, showers, bathtubs, whirlpool bathtubs and more. Talk to us about the look you want for your home, and we will show you how we can help with repairs or installation. Come drop by our showroom for more information and to see our large line of available products for changing the look of your home. We are located just a few minutes from Lee's Summit at 3303 Main Street in Grandview.